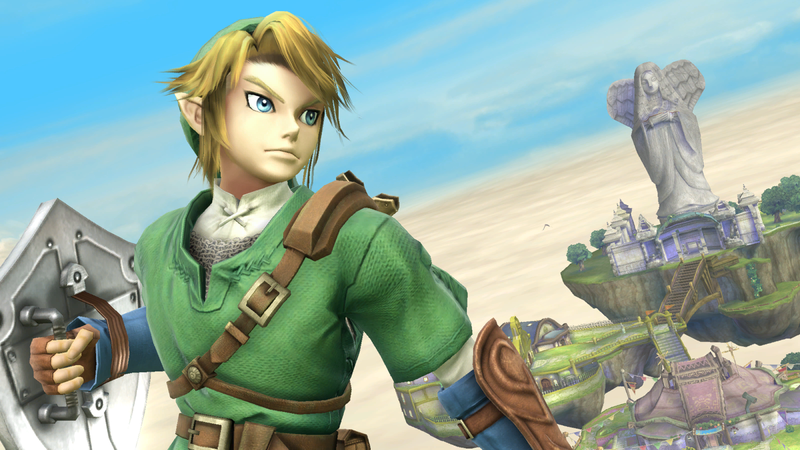 Link has several unique attacks that can surprise and disorient his opponents. A prime example of this is his jab, which comes out swiftly and hits surprisingly hard. His smash attacks are even stronger: his forward smash consists of two separate hits instead of one, and his up smash (one of the most effective aerial punishes in the game) hits multiple times while dealing incredible damage. Link is not only threatening at close range, but at a distance as well: he has a wide range of projectiles that allow him to rack up damage from afar and keep enemies at bay. He can even use his arrows to gimp recovering foes! His recovery is also quite good – while his up special doesn’t go very far, his tether recovery is a fast and reliable option. Finally, Link is very resilient thanks to his heavy weight, and this makes him more than capable of stomaching powerful hits. Unfortunately, Link’s grab is horribly slow, and leaves him vulnerable to attack if missed – and since amiibo usually rely on their grab as a primary option (and hence use it frequently, regardless of its speed), opponents will have many opportunities to attack. Rounding out his cons is a minor flaw in his AI – he doesn’t use his Bombs very well. He’ll either toss them upwards to no effect or hold onto them for too long and damage himself with the resulting explosion. With proper training, Link can work wonders in competitive play; the key is to teach him to play defensively and to strike a balance between melee and ranged attacks. It takes some effort to sharpen his skills, but as long as you follow the information presented in this guide, you’ll be on the right track to turning your Link into a champion. Boomerang: Link’s regular side special is actually called Gale Boomerang. Gale Boomerang and regular Boomerang are two different moves. 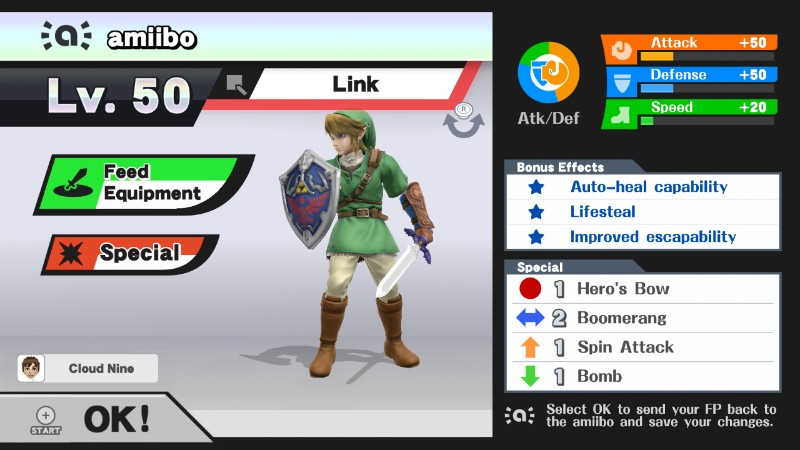 Boomerang, Link’s second custom move option, doesn’t have the wind effect that the default attack has, but deals more damage and is easier to aim. It’s a more traditional projectile and is better at racking up damage from afar. Your Link amiibo will use this move to great effect. Neutral options: jab and Boomerang. 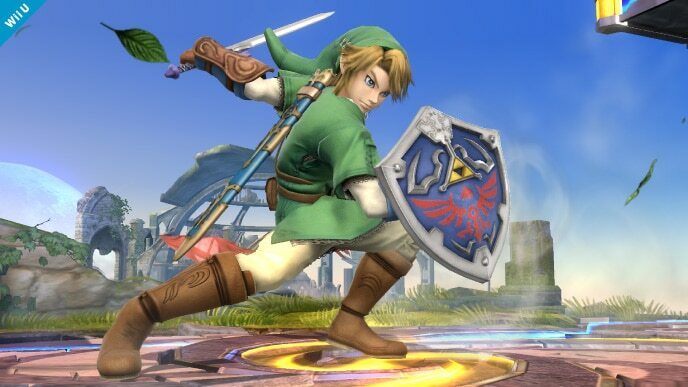 Link’s most reliable method of racking up damage is his jab: it’s fast, moderately powerful, and has low ending lag. Link’s AI doesn’t have the greatest grasp on its arrows and bombs, but it can use its Boomerang to great effect – almost to a point of spamming. Encourage the use of Boomerang by frequently attacking with your own. Main KO moves: forward smash and up smash. 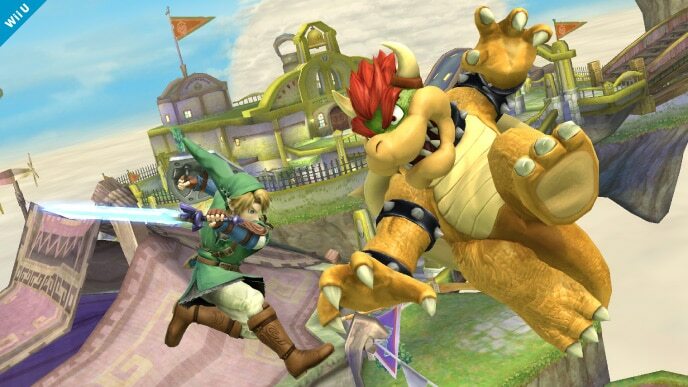 When you use Link’s forward smash, be sure to use both hits of it by pressing the attack button twice. Up smash is one of the best aerial punish moves available. When your amiibo jumps, strike with a well-timed up smash. Moves to avoid: grab, grab aerial, neutral special, and down special. Since Link doesn’t benefit from using his grab, it’s best to stay far away from it. When recovering, use up special and not the tether recovery – using it anyway will encourage your amiibo to jump around more often. As mentioned before, Link’s amiibo struggles to properly use its Hero’s Bow and Bomb attacks – Boomerang is the only projectile it can consistently put to good use. As a result, it is best that you avoid attacking with any projectile other than Boomerang. Thanks to Arklaine for compiling Link’s information. Images are courtesy of SmashWiki and the official Super Smash Bros. website. A neat trick to teach a link that i discovered, is to down tilt, then use boomerang about 3 times then jab. It is a good damage racker that amiibo may be able to learn if used properly.